And just like that the season ends for the Washington Capitals. It wasn't even a question whether the Caps could make a dramatic comeback. The Tampa Bay Lightning were just too good. The Caps showed signs of a comeback but again failed to score first. They would be swept in just four games by a score of 5-3. Just like a broken record, game 4 was little to no different than the previous three. The Lightning got the early lead and although the Caps make an effort to tie up the game and play outside their comfort zone. Add a few break downs in special teams and an outstanding effort by the Lightning's role players, and the Caps make an unexpected quick exit from the playoffs. Ryan Malone put the Bolts up early after Alex Ovechkin took a questionable charging call on a heavy hit. The Caps would answer with a power play goal of their own when Marco Sturm scored his first goal of the playoffs. They would survive the first period with the score tied 1-1. But Sean Bergenheim, the new Cap killer, scored a pair in the second period and the Lightning took their first two goal lead since netting an empty netter in game one. Bruce Boudreau called a time out to settle his team down, and John Erskine scored his first goal of the playoffs on a sharp angle shot that fooled Dwayne Roloson. But early in the third period, Marc-Andre Bergeron scored on the power play to regain the two goal lead. Sturm took a goaltending interference penalty call, even though he never touched Roloson who embellished the non-contact. The Caps were unable to produce much in the way of offense after that as the Lightning shut down the neutral zone. Martin St. Louis put the icing on the cake scoring to make it 5-2. John Carlson scored late to make it 5-3, but the damage was done. What was left was the handshakes and quick exit for a top seeded team defeated in four games. The Lightning did it with some key role players scoring some big goals. Michal Neuvirth played as well as can be expected. I don't think he played any better or worse than his counter part Roloson. While he was screened by his own man Carlson on the Bergeron goal, Neuvirth did come up with some big saves through out the series. He had a few big saves in game four as well, but it was the team in front of him that let him down. The Caps now have more questions than answers. While it hasn't been the best season for them, they were able to gain top seed in the east only to be ousted by a division rival they had beaten 5 times in six regular season games. It is an off season that has come to soon for a team that has set the bar too high apparently. Now it's a decision to find players, personnel or both to make changes too. Mike Green was a scratch in game four after sustaining an injury in game three. Sean Collins replaced him in his first NHL post season appearance. The Lightning are on a roll, winning seven straight in these playoffs. 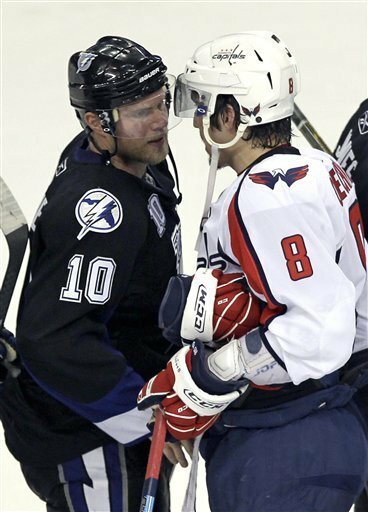 But the Lightning have done this to the Capitals before. They won against the 2003 Capitals with Olie Kolzig in net and some loser named Jaromir Jagr four games to two. That would eight straight post season wins for Tampa against the Caps. This marks the fourth straight exit in the post season for the Washington Capitals. All three in differing fashions. An editor's note: The New York Islanders lost four consecutive times in the conference finals before they won four straight Stanley Cups. Silver lining.